Dental implants have been available for several decades. However, for most patients, they are still a relatively new concept. Are you looking for cost of dental implants and comparing quotes? Here are some important issues to keep in mind during the process. Do you have a missing tooth or teeth? If so, you’ve started searching for the cost of dental implants against other tooth replacement methods (dentures and bridges) It is important to take into consideration the longevity offered by dental implants that is not always afforded by other, more traditional methods. Dentures and bridges are less expensive, however their affordability can be short-lived. Because these older methods require repair and replacement every 5-10 years, they are often more expensive over time. By contrast, dental implants, when properly placed and cared for, can last a lifetime. Over time, when a tooth is missing, the jaw bone deteriorates. A denture or bridge may seem to function similarly to a tooth, but underneath the surface, damage is being done to the jaw bone and ultimately to the structure of the face. This can result in the distortion of the shape of a person’s face, leading to additional cosmetic costs down the road. Dental implants are made of titanium, which integrates with the jaw bone, strengthening your jaw and stimulating bone growth. This preserves the natural strength and quality of the mouth, lessening problems in the future. Dental implants are a long-term investment because of the quality of life they provide. 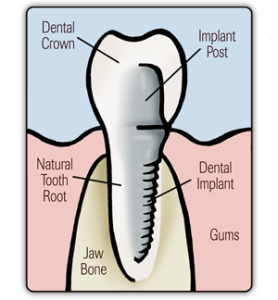 A dental implant is the closest thing to a natural tooth. Dental implants allow the patient to eat the same foods he or she has always enjoyed as well as eliminates the hassle/embarrassment that is frequently caused by dentures. The best way to receive an accurate price quote is to call us and come in for a consultation, and we can give you a specific price for your case. Please call us at 773-883-1818 to schedule your free consultation.